Chandigarh 29th September:- Inquilab Zindabad. A phrase that was coined by Maulana Hasrat Mohani in 1921 and later popularised by Shaheed-E-Azam Bhagat Singh, it became one of the rallying cries of the Indian Independence Movement. The revolution that aimed to end British tyranny, oppression and dominance over the subcontinent might have succeeded, but it has taken on a newer meaning in present day Punjab. Keeping this in view, Sahaj Music Records announces the launch of their new single, "Inquilab". Sung by Ravi Inder Sheen, the song aims to promote the ideology of never giving up and is dedicated to all those people who, despite facing numerous difficulties, have never bowed down to any kind of oppression. Talking about this new venture, the producers Bhanu Sharma and Ved Yadav said that currently, Punjab is undergoing a difficult time due to a rise in drug addiction, female foeticide, Casteism, farmer's suicides and violence. This song is an attempt to rally the youngsters of the state to bring forth a revolution that aims to put an end to all these evils. If all the youngsters and the entire population in general devote their time and energy towards following the ideology of Shaheed-E-Azam Bhagat Singh, Punjabi Society will once again reclaim its lost glory. "We have decided to release the song on September 28, as this is the 90th birth anniversary of Shaheed-E-Azam Bhagat Singh. By interacting with people at places like the Darbar Sahib and Jallianwala Bagh on Bhagat Singh's birth anniversary, we will try to highlight the importance of the words Inquilab Zindabad and their significance in today's day and age", says the singer of the song, Ravi Inder Sheen. The lyrics of the song Inquilab have been penned by Prince Dhunna and Ravi Inder Sheen. It was Prince Dhunna's poem `Tusi kuj hor vehnye ho' which touched a chord with Sheen and Sahaj Music Records. Sheen then wrote and composed it in the form of a song to give birth to `Inquilab.' Prince Dhunna is a poet from Patti (Tarn Taran district). In an attempt to sensitise as many people as possible, the team will be travelling to cities like Amritsar, Jalandhar, Ludhiana, Barnala, Patiala, Ferozepur, Faridkot and Chandigarh to engage in conversations with people and hear their views about today's Punjab. This not only will help people to think of innovative solutions to tackle today's problems, but will also give the producers innovative ideas to come up with more songs on socially sensitive issues. "Since we have planned to release one song every month, this initiative will help us in understanding the problems faced by the people living around us", feel the producers. Chandigarh 29th September:- The Eco Club of Maharishi Dayanand Public School, Daria , Chandigarh organized Essay Writing Competition on a Green Consumer Day with collaboration of the Environment Department of Chandigarh on the school premises today. This competition was divided into two categories i.e., junior and senior. Students expressed their feelings on clean environment and about global warming caused by cutting of trees. They stressed to grow more trees for balancing of environment. They told that everyone should purchase products that are Eco-friendly. Products with little or no packaging, products made from natural ingredients and products which are made without causing pollution are Eco-friendly products. The green consumer should drive a hybrid vehicle; buy products made with hemp or those made from recycled materials. Shivam Shrey and Sahil bagged first, second, third and consolation prizes in junior category in senior category Jatin Singh, Bhola Kumar and Vishal singh got first, second and third position respectively. Principal Dr. Vinod Kumar gave away prizes to the winners. He said that the main aim of this program was too aware the importance of recycling-reusing and reducing waste. Chandigarh 29th September:- Once again the air is full of excitement, as it's that time of the year when a flurry of festivals start knocking on our doors. 'Navratras' are concluding, while Dusshera, Karwachauth & Diwali are festivals people have already started looking forward to & making preparations for. All these festivals will soon be followed up by the big fat Indian wedding season. Pankaj Jain, Director, The Rising, the company under who's banner Trends Exhibitions are organised said that looking at the need for a single platform for festival & wedding needs we have put up a lifestyle showcase --'Trends Festival. This is the 17th Edition of Trends Exhibition which has come to be known as a very customer friendly exhibition. The Exhibition has started in Kisan Bhawan & will be on from 29th September to 2nd October 2017. In this 4 day Exhibition exclusive products related to festive season have been showcased. There is designer apparel, bridal wear, Indo Western wear, fashion accessories, footwear, furniture, home decor, specialised Karwachauth & Diwali stalls all under one roof. Designers have come with their creative collections from all over India. To ring in Karwachauth & the Wedding season, Rosy has brought designer Karwa Thalis, Kalash etc. Not just this, another major attraction that she has are wedding boxes, readymade packing for bridal dresses, Sarees, Lehengas, Suits etc & the Bangle boxes are quite a draw. Looking at Diwali which is around the corner, Alka has brought designer candles in her collection. There are candles ranging from gel, wax, scented, floating diyas etc. She has a range of beautiful 'Torans' too. Fashion label Nanki creations is present with its collection. Mystique too showcased it's ensemble. Label ' Albeli' is here with designer dresses & Juttis. 'Pari Creations' has showcased beautiful dresses. A wide range of Wedding Gowns' collection is also there. Many more designers of bridal, party wear etc are lending a lot of variety to 'Trends Festival Exhibition'. Accessories to go with the festive dresses are being catered to by exhibitors like 'Majaajan' which has a collection of unique earings & hair accessories. One can get to choose from an array of Exotic Jewel pieces at 'Radhika Jewels', which brings Hyderabad pearl & Kolkata jewellery. 'Me & You' has brought from Jaipur exquisite handloom products. Dari carpets, cushion covers, bed sheets, runners, Dohars with floral prints, quilted bed covers, curtains, dining sheets etc all are there in its ensemble. A stall just at the entry of the exhibition hall 'Look N buy ' is attracting people, as it has lovely lamps to add to your home's festive decor. 'Brand On' is a House of modern furniture to deck up your home. The famous Badohi carpets are also available. Not just this Exhibitors have come with a wide array of towels, imported leather bags, imported Western ear etc. Specialists in fabric & traditional Indian handicraft from different states of India have converged at 'Trends Festival Exhibtion'. With Karwachauth approaching there is a Free Mehndi stall where women can get beautiful Mehndi done. Chandigarh 29th September:- P C Jeweller, India's premier jewellery brand announced their foray into media entertainment in celebrity endorsements and announced their brand ambassadors from Bollywood the stunning Twinkle Khanna and the ruggedly handsome Bollywood megastar Akshay Kumar a.k.a Mr & Mrs Khiladi. As part of the one year agreement, PCJ will leverage the versatility of the star couple, who have Bollywood's filmy legacy and Twinkle's status as a celebrated author, producer and columnist. Both Akshay and Twinkle's brand presence resonate with luxurious style of PC Jeweller as a brand. The company will be releasing a TV and print commercial featuring the dynamic star couple encapsulating the essence of the brand and the art of jewellery creation. PCJ, country's leading and one of the fastest growing jewellery retail chain has 84 showrooms across 67 cities in 20 states of India. With a portfolio of attractive wedding jewellery and affordable wearables, PC Jeweller has fashioned exceptional designs with unmatched quality. The brand has been a pioneer in designs as every product is crafted to a standard of perfection. Its range of both traditional and contemporary jewellery has always earned admiration for its unique craftsmanship. Speaking on the partnership, Balram Garg, Managing Director PC Jeweller said that we are thrilled to announce Akshay Kumar and Twinkle Khanna as PC Jeweller's brand ambassador and we warmly welcome them to the PCJ family. The star couple sets formidable example about bond of love and cherishing relationship. We believe this association will further add spirit to the brand and strengthen PC Jeweller brand image in the country." National award winner Akshay Kumar has proven his mettle with series of versatile roles in films spanning over multiple genres. Twinkle Khanna, who also had an enjoyable beginning in Bollywood is now a sought-after interior designer and very well-known author. The couple embodies a bond of trust which complements PC Jewelers legacy and brand ethos. On being the brand ambassador of PC Jeweller, the star couple Akshay Kumar and Twinkle Khanna said that it has been an absolute pleasure to be a part of the PCJ family and we are happy to be associated with the brand known in the country for its jewellery, design, captainship and trust. We look forward to being a part of its fascinating growth journey in India. 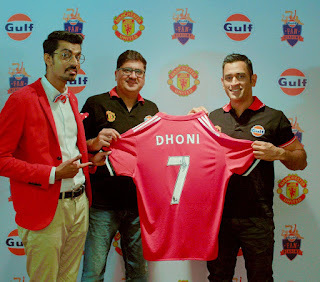 Chandigarh 29th September:- Gulf Oil Lubricants India Ltd, part of the Hinduja Group, in collaboration with Manchester United, today unveiled a unique campaign – 'Gulf Fan Academy', with the aim to connect with ardent Indian fans of the football club. The Gulf Fan Academy is a part of a multi-rollout comprehensive campaign to highlight Gulf Oil's association with Manchester United as the official global retail fuel and lubricant partner. Ravi Chawla, CEO & MD, Gulf Oil Lubricants India Limited said that the Gulf Fan Academy is a unique platform by the fans, for the fans, to the fans of Manchester United. The initiative will be instrumental in enhancing Gulf Oil's digital footprint and present an innovative way to engage with the 600 million fans, spread across India and the world. Gulf Fan Academy will provide the fans with an opportunity to showcase their fandom in their own unique ways, while uniting them with their favourite football club under one platform. We would like to specially thank the #NumberOneFan enrolled into the Gulf Fan academy Mahendra Singh Dhoni, who can be seen showcasing his passion and love for the Manchester United club. The 'Gulf Fan Academy' is going to be driven by popular stand-up comedian Azeem Banatwalla, who as the Chief Fan Officer will engage with fans, some of whom are high profile personalities. A self-confessed fan of Manchester United, cricket legend Mahendra Singh Dhoni will feature in the video doling out details & conversations that highlight his love for the club. The 'Gulf Fan Academy' will engage Manchester United fans through a variety of original entertaining content as well as by hosting a series of contests in the form of challenges on social media along with on-ground activations. Fans who prove their mettle through endurance and passion, will be awarded at the Gulf fan academy with official Manchester United autographed merchandise and in many other ways. They will also be groomed to become the ultimate fan and gain access to the Hall of fame. These top winners will then get a trip to Old Trafford (UK), the Theatre of Dreams and home of Manchester United. Chandigarh 29th September:- The Indian Clearing Corporation Limited ("ICCL"), has been granted renewal of recognition by the Securities and Exchange Board of India ("SEBI") for a period of three years commencing on October 03, 2017. ICCL is a wholly owned subsidiary of BSE and carries out the functions of clearing, settlement, collateral management and risk management for various segments of BSE. ICCL was granted Qualified Central Counterparty ("QCCP") status by SEBI on January 3, 2014. A QCCP member is subjected to lower capital requirements/charges under the Basel III framework introduced by the Basel Committee on Banking Supervision. ICCL, as a Qualified CCP, is additionally required to comply with the rules and regulations that are consistent with the Principles for Financial Market Infrastructures ("PFMI") issued by the Committee on Payment and Market infrastructure ("CPMI") and International Organisation of Securities Commissions ("IOSCO").These rules and regulations focus on limiting systemic risk and on enhancing transparency and stability in the financial market. ICCL is a recognised clearing corporation under Regulation 4 and 12 of Securities Contracts (Regulation) (Stock Exchanges and Clearing Corporations) Regulations, 2012. ICCL is regulated by SEBI and the Reserve Bank of India ("RBI"), for select products. ICCL is the only clearing corporation in India to have been granted "AAA" rating by two rating agencies, India Ratings Ltd. (Indian arm of Fitch Ratings) and Care Ratings Ltd. ICCL aims to provide secure, capital-efficient counterparty risk management and post-trade services and has put in place a robust risk management framework to mitigate the risk it undertakes in its capacity as a clearing corporation. IIPA organizes Regional Conference on "Demonetisation and its Impact"
Chandigarh 29th September:- The Indian Institute of Public Administration (IIPA) Panjab and Chandigarh (UT) Regional Branch and the Department of Public Administration, Panjab University, Chandigarh jointly organized a Regional Conference on the Theme Paper of Members' 2017 Annual Conference of IIPA titled, "Demonetisation and its Impact". Professor B.S. Ghuman, Vice-Chancellor, Punjabi University, Patiala and Honorary Secretary IIPA Regional Branch while introducing the theme opined that demonetization has been a part of mainstream discourse among academicians, policy makers and politicians. The differences in terms of views on demonetization are due to diverse nature of methodologies used for assessing the impact of demonetization on a short term and long term basis. The Regional Conference in this regard shall discuss evolving methodologies to assess the impact of demonetization. Professor Ramanjit Kaur Johal, Associate Director, Research Promotion Cell and Chairperson, Department of Public Administration, PU, Chandigarh introduced the Key Note Speaker, Professor Upinder Sawhney, Chairperson, Department of Economics, Panjab University, Chandigarh. Professor Sawhney shared the major findings of the theme paper such as demonetization strengthening India's institutional framework by reducing tax avoidance and corruption, resulting in efficiency gains through greater formalization of economic and financial activity, helping in broadening the tax base and expanding usage of the financial system. She further pointed out that the data brought out by the RBI has reported that 99% of the declared illegal tenders have come back to the central bank. Therefore the impact of demonetization on corruption seems to be minimal. The agriculture and MSMEs have suffered on account of disruption created in the economic chain. The lecture was followed by observations and questions. 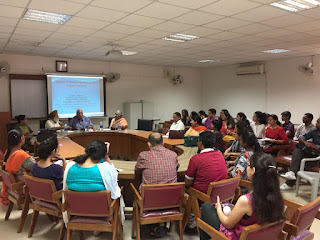 Dr R. Kumar, Sohail, Dr Ranjeet Singh, Ms Seema, Dr Namit, Ms. Mridul, Ms Amanjot, Professor Ramanjit Kaur Johal and Dr Jawinder Kaurparticipated in the discussion. A large number of faculty members, members of the IIPA and research scholars and students attended the Regional Conference. B.S. Ojha IAS (Retd.) Chairman of the Regional Branch presided over the regional Conference and also actively participated in the discussion. B S Ojha during his presidential remarks opined that things will improve in future as the difficulties being faced will be sorted out by the system. Chandigarh 29th September:- Roadies fame Ranvijay Singh and noted actor Sahil Khan along with organizers Mohit and Tarun Gill today conducted the auditions for the fitness freaks under the aegis of Fitness League of India (FLI) today at Weave Cinemas. The auditions witnessed a massive participation from youth across the tricity for auditions. During the interaction, Ranvijay said however we have seen lot many youth has been participating in Roadies but this Fitness League of India (FLI) is a different platform. Ranvijay said that he would like to stay fit but fitness doesn't meet you stay slim or maintain six pack body. The true sense of being fit is far away from diseases. If you are not sick and even being slim without any fitness is the clear indication of fit. Ranvijay said that he is very happy to see the kind of response because the youth across the tricity is truly aware of their fitness. 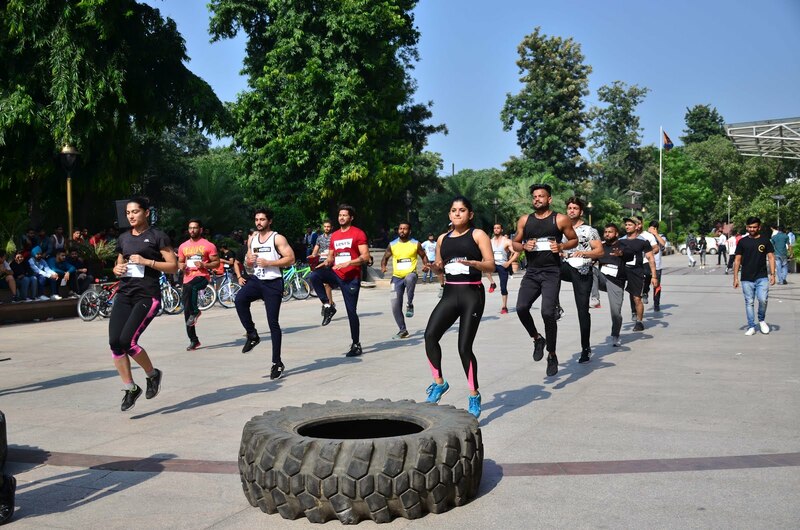 Present of the occasion organizer Mohit said that it is a reality show which is based on fitness and today we are testing the fitness of youth. Another organizer Tarun said that there was an absolute overwhelming response from youth and their shared the fitness related tips with us. Sahil Khan said that he too is very inclined towards the fitness and happy to see the energy filled youth of Chandigarh. He said, they are simply passionate towards the fitness. He said this series of audition are taking places in 17 cities of country which will select 100 contestants. The winner at the grand finale will win a cash of three cores, an acting offer in Bollywood apart from one Harley Dividson motorcycle. Chandigarh 29th September:- The health landscape in the country is gradually changing with the majority of deaths being caused by lifestyle diseases. Cardiovascular diseases (CVDs), are posing a huge challenge. They have become a growing epidemic in the country and have become a prominent cause of illness and death. A combination of sedentary lifestyle, unhealthy eating habits and genetic susceptibility are contributing to this rising trend. The nationwide prevalence of coronary heart disease is around 12% in urban population and 4% in rural population. Increasing urban prevalence is because of industrialization, changing dietary habits and unhealthy life style. High intake of fat, calories, alcohol and smoking habits are the main risk factors for coronary heart disease. To combat the rising burden, preventive measures are required on urgent basis. Prof Rajesh Vijayvergiya from Department of Cardiology, PGI, Chandigarh commented that control of certain risk factors like smoking, hypertension, diabetes, obesity, stress, and adoption of healthy life style can help in prevention of CVD. One should have an urgent consultation with a doctor for the presence of any one of the warning symptoms of heart attack. Two type of patients one is diabetic and second is women, who can have non-classical symptoms; hence they should be thoroughly evaluated when presented with chest pain. Certain diseases like diabetes, aortic aneurysm, peripheral arterial disease of lower limbs and brain should be aggressively managed as they are equivalent to heart disease. 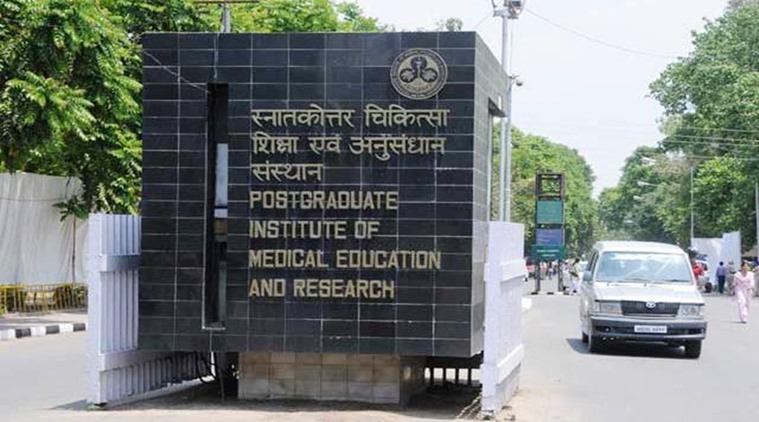 Professor Dr Vijayvergiya commented that control of various risk factors not only improves the incidence of heart disease, but it also improves rate of stroke, renal failure, peripheral arterial disease, quality and quantity of life. He commented that the screening for various risk factors should start as early as 20 years of age and should be regularly checked every 5-yealy. After the age of 40 yrs, one should regularly and periodically undergo various stress tests like treadmill test (TMT), stress thallium or stress echocardiography to rule out asymptomatic coronary artery disease. 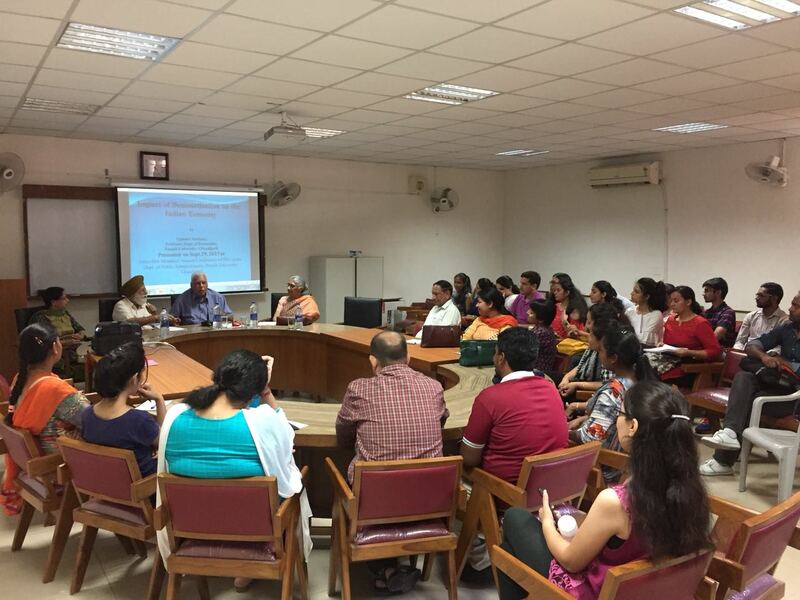 Chandigarh 29th September:- The Women Development Cell of MCM DAV College for Women organized an interactive session on 'Legal Literacy: A tool for Women Empowerment' today. The objective of the session was to empower women by generating awareness about the legal rights that they are entitled to. B.L. 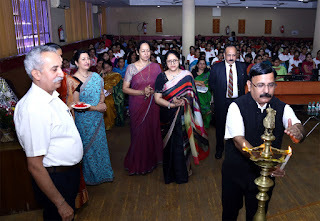 Sharma, Education Secretary, Chandigarh was the Chief Guest and R.K. Popli, Director Higher Education, Chandigarh was the Guest of Honor on the occasion. The speaker for the event was Advocate Ajay Jagga. The function began with lamp lighting symbolizing gratitude towards Almighty. In his address, B.L. Sharma cited exemplary women right from Vedic ages to contemporary times to stress upon the importance of women in each and every aspect of life, and reiterated that a society that respects women progresses. Speaking on the occasion, R.K. Popli appreciated the efforts undertaken by MCM to empower its students and faculty. Terming women as creators and architects of society, Advocate Ajay Jagga said that it is an irony that even highly educated women are not aware about their legal rights. Sensitizing the participants about their legal rights, he said that a woman with a voice is a strong woman and it is the knowledge about one's legal rights that will make her voice stronger. Informing the audience of the initiatives like self defense training, sensitization programmes, etc. being undertaken by MCM to empower its students, Principal Dr. Nisha Bhargava said women are naturally endowed with the power to endure, they just need to realize their potential as empowerment comes from within. Chandigarh 29th September:- Keeping the festive spirit alive, Dussehra was celebrated at CRB Public School in Sector 7-B, Chandigarh. Various activities including speeches on Dussehra, Poetic Ramayana and a dance in Hanuman Chalisa glorified the occasion. Students draped themselves as Lord Rama, Sita and Laxmana and presented themselves.To mark Lord Rama's victory over Ravana and to reinforce the message that good always triumphs over evil, the effigy of Ravana was also burnt. CRB School Director Naveen Mittal and Principal Mrs. Sangeeta Mittal blessed the students and inspired them to follow the path of truth and to respect women. As these celebrations bind the students to their traditional and cultural roots. Chandigarh 28th September:- Radio network 92.7 Big FM brought back the renewed edition of 'Suron Ki Nau Deviyan' with an aim to celebrate a nine-day musical fest with a focus on women empowerment. Big FM became the first radio station to specially compose nine sufi-folk songs highlighting the virtues of the nine goddesses during Navratri. Nine female artistes , who included renowned bollywood singers like Shweta Pandit, Harshdeep Kaur, Prajakta Shukre and Shradha Pandit featured solo in the videos of these songs. The activity created right connects with listeners during a one-hour special evening show dedicated to each singer during Navratri. Big FM spokesperson stated that it is our conscious effort to be a platform that provides meaningful content that is edgy and relatable. While we are connected with listeners through the power of radio we are also taking our digital presence a step forward with engaging video formats". The sheer magnitude of the nine day activity was that well-known artists on-board bolstered the appeal for our listeners and digital consumers across demographics, thereby providing extensive visibility to the advertisers. 'Suron Ki Nau Deviyan' is an amalgamation of music and story-telling through which the radio network celebrated Navratri. Big FM aims to embody the essence of providing more music to its listeners with content that promotes women empowerment through the dedicated songs. The one-hour special show was based on the theme which symbolizes the virtue of the goddess of that specific day such as strength, beauty and power. With songs highlighting these expressions in the voice of the singers that resonate with each, the radio station celebrated women power . Listeners were enlightened with motivating narratives on the journey and accomplishments of these distinguished female artists. Chandigarh 28th September:- The 5-day long 6th CanKids childhood cancer awareness rally concluded at Rail Majra near Ropar today. The rally, aimed to spread awareness on childhood cancer, was organized in association of Max India Foundation (MIF). Over 20 childhood cancer survivors took part in rally which was started from New Delhi on September 23. Mohini Daljeet Singh , CEO- MIF , Ramneek Jain, CEO Max Speciality Films and Dr Sachin Gupta , medical oncologists at Max Hospital , Mohali, welcomed the rally and its participants . The cancer survivors reciprocated by spreading the important message that childhood cancer is curable. They performed to show the energy of the champions. During occasion, Muskan, a young cancer survivor of 17-yr shared her experience and exhorted the need to speared awareness on cancer so that the disease could be checked in its initial stage. Dr. Sachin Gupta spoke on the curability of childhood cancer. He appreciated the role played by CanKids and MIF in providing funds and support for the treatment of needy children. Ironically in India, it is estimated that nearly 40000 to 50,000 new childhood cancer cases present each year. As in adult cancers, 70% children with cancer still die of disease in India due to lack of awareness, late detection and diagnosis, inadequate pediatric cancer treatment facilities, the exorbitant cost of treatment and lack of supportive care. Mohini Daljeet Singh said that the need of the hour is to ensure that childhood cancer is recognized as a child health priority in the country. MIF aims for holistic care for children with cancer and their families, in all its endeavors. We strive to improve survival of children with cancer & quality of life and the rights of the child with cancer and the family. 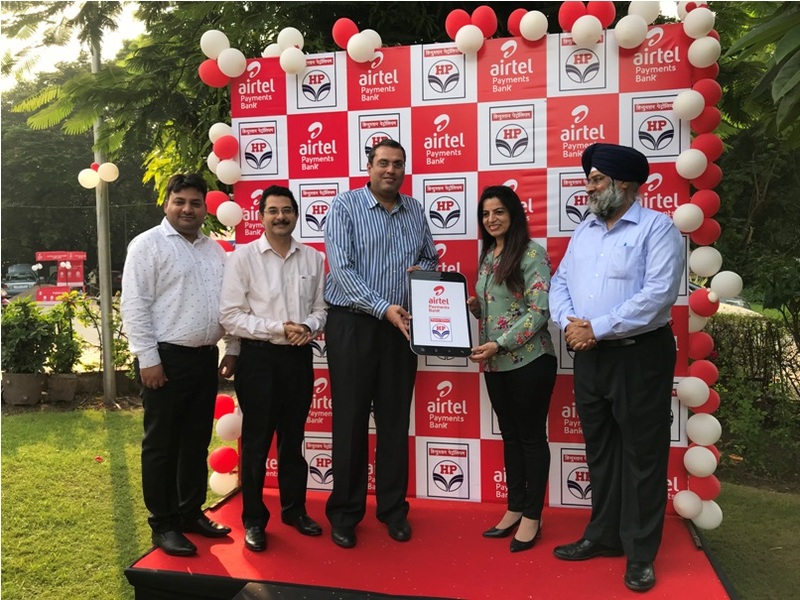 Chandigarh 29th September:- Airtel Payments Bank customers can now make secure and convenient digital payments for fuel purchase at 916 HPCL fuel stations across Punjab and Chandigarh. The announcement was done today during the inauguration of first HPCL fuel station as banking point in Punjab and Chandigarh at the HPCL fuel station in, Sec 31, Chandigarh. These cashless payments can be made via smartphones (MyAirtel App) as well as feature phones (USSD) and customer is not charged any transaction fee for these digital payments. All Airtel Payments Bank customers would also be able to access a range of convenient banking services at these 916 fuel stations e.g., open new accounts, make cash deposits and withdrawals facility, and transfer money. This will add to the depth and reach of Airtel Payments Bank's retail based network that leverages over 40,000 Airtel retail outlets as banking points in the state. Shashi Arora, MD & CEO, Airtel Payments Bank said that the partnership with HPCL would boost our endeavor to build a robust and diverse merchant ecosystem that brings more digital payments avenues to our customers. We are, in particular, pleased to have these fuel outlets as our banking points. We are confident that this partnership will add to the growth of digital payments in the state of Punjab and contribute to the Government's Digital India vision. Chandigarh 27th September:- The International Committee of the Red Cross (ICRC) and the Global Disability Innovation Hub (GDI Hub) are calling for entries for "Enable Makeathon 2.0" to crowd source new, innovative solutions by and with persons with disabilities (PwDs) for challenges faced by them. Applications are invited from PwDs, designers, the scientific and innovation community, manufacturers and entrepreneurs. The deadline for the applications is 30 September 2017. This year, the programme addresses 12 accessibility and employability related challenges faced by persons with hearing or sight impairment or with locomotor disabilities. Commenting on the project, Tarun Sarwal, Innovation Advisor at the ICRC said that enable Makeathon is a unique social movement. It brings together a multidisciplinary team of experts with persons with disability to find solutions for the real challenges that they would like to address. The platform allows us to take ideas from their conceptualisation to execution to testing in a fairly short span of time. Just like the first edition of Enable Makeathon, I have no doubt that Enable Makeathon 2.0 will also be a resounding success and deliver effective, inclusive solutions that are much needed in challenging contexts globally." 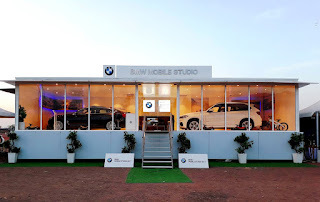 Rohtak 27th September:- BMW India has introduced the BMW Mobile Studio - one of its kind mobile showroom designed exclusively to showcase the most aspirational BMW products and services in over 50 emerging markets across India. The BMW Mobile Studio in Rohtak is hosted by Libra Autohaus and will be stationed from 16 - 17 September 2017 at Tilyar Tourist resort, Delhi road, Rohtak. Vikram Pawah, President, BMW Group India, shared that designed with a focus on the premium customer experience, the BMW Mobile Studio is a persuasive concept that provides us with a platform to showcase our interpretation of luxury in emerging markets across India. Customers and prospects can obtain a comprehensive overview of BMW's expertise in luxury cars, discuss various products, service and finance options in depth with experts and choose their favorite Sheer Driving Pleasure. Manreet Singh Libra, Dealer Principal, Libra Autohaus said that the demand for luxury cars is increasing across emerging markets and the BMW Mobile Studio is a perfect platform for us to cater to this potential market. We are looking forward to showcase the dynamic BMW product range and services in Rohtak. The all-new BMW 5 Series and the BMW X3 will be on display while the BMW 3 Series, the BMW 3 Series Gran Turismo, the all-new BMW 5 Series, the BMW X1, the BMW X3 and the BMW X5 will be available for test drives to automobile enthusiasts visiting the BMW Mobile studio. Chandigarh 27th September:- Kadakampally Surendran, Minister for Tourism, Government of Kerala received six National Tourism Awards 2015-16 from The President Ram Nath Kovind, Vigyan Bhawan in New Delhi today. The Department of Tourism, Government of Kerala has been lauded with Hall of fame award for the 'Most Innovative Use of Information Technology - Social Media / Mobile App' for the ninth consecutive year. Out of these six awards, Kerala Tourism bagged two awards in the marketing category, including 'Best Tourism Promotion Publicity Material' for a film tourism brochure- 'Your Next Blockbuster Destination' and 'Excellence in Publishing in Foreign language other than English' for a Spanish Brochure titled "Reanimar – Enel Propio Pais de Dios", conceived and developed by Stark Communications. The film tourism brochure highlights the picturesque beaches, exotic wildlife, hill stations and unexplored backwaters that are amongst just a few of the prime locations that can be used to shoot any form of media. The Spanish brochure encapsulates the key attractions of the state, highlighting why Kerala is considered to be the most sought-after destination across the world. 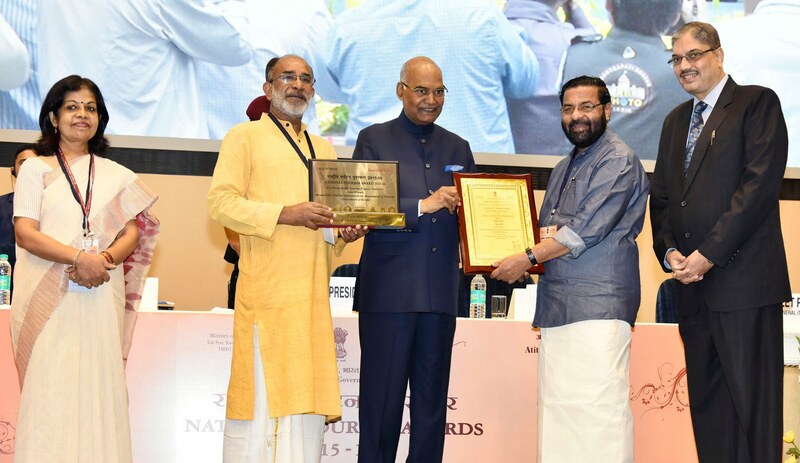 The state tourism also bagged an award for the Best Responsible Tourism Initiative for 'Kumarakom'. The spirit of Kerala's Responsible Tourism is based on the availability of plenty of natural resources, skilled manpower, supportive entrepreneurial community, strong local-self-governments, civil-society organizations, multitude of micro enterprises, streams of professionals and academicians, responsible media and responsive tourism industry. All of these initiatives provide the state an ideal setting to implement and practice it. Speaking about the significance of the responsible tourism initiative, Kadakampally Surendran, Honorable Minister for Tourism, Government of Kerala stated that it give us immense pleasure to be lauded with the prestigious National Tourism Awards in six different categories. Kerala Tourism has been focused on promoting the concept of 'Responsible Tourism' for protecting environment and conserving cultural heritage. And, receiving award for this significant initiative of the state emboldens the tourism department to keep up the positive momentum. Moreover, the state was lauded with 3 National Awards in private sector. Lotus Destinations Pvt. Ltd., Cochin bagged award for Best Tour Operator Promoting Niche segments other than MICE and adventure and Vivanta by Taj, Kumarakom received award for Best hotel – 4 star category and Somatheeram Research Institute & Ayurveda Hospital Pvt. Ltd bagged award for Best Wellness Centre. With the aim to promote river-cruise tourism, the Government of Kerala has envisioned Rs 300-crore project for nine rivers in Kannur and Kasaragod. In addition, the State government is planning to develop quite a few adventure parks for adventure enthusiasts. For which, the government allocated Rs. 45 crore for Prasadam project and Rs. 20 crore for Green Carpet scheme for Alappuzha, Enranjil, Neyyar and Thenmala. Dr. Venu V, Principal Secretary, Department of tourism, Government of Kerala said that receiving such prominent awards for the innovative marketing strategies and the usage of technology in tourism have enhanced the profile of the state as a sought-after destination across the world. Over the years, the persistent recognitions for Kerala in the national forum have positioned the state as a preferred tourist destination for domestic as well as international tourists. Chandigarh Police Organizes Awareness Programme on “Organ Donation and Role of Police in Organ Donation"
Chandigarh 27th September:- An awareness programme on "Organ Donation and Role of Police in Organ Donation.'" 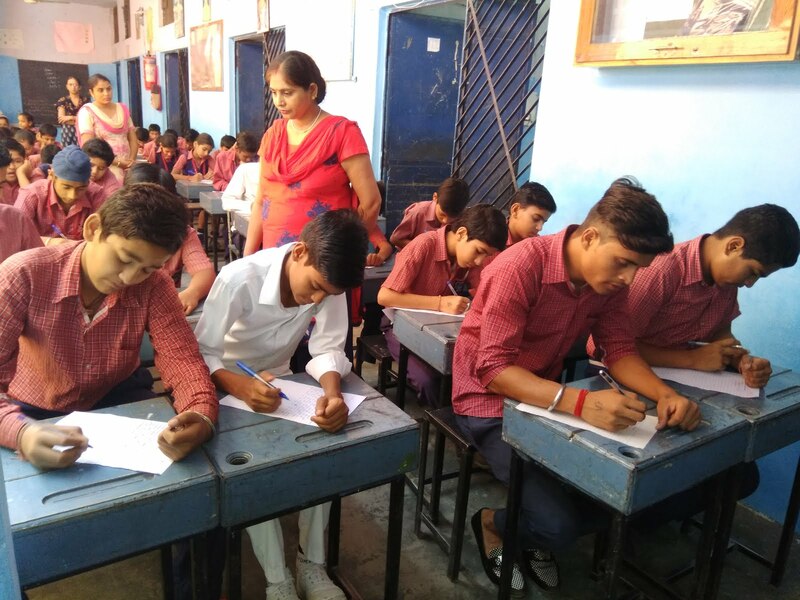 was organized in collaboration with Mohan Foundation in Recruit Training Centre(RTC) , Sector-26, Chandigarh under the guidance of Tajender Singh Luthra, D.G.P., U.T., Chandigarh and under the supervision of Ravi Kumar, S.P./ Operations & Training. 167 police officers (Inspector, Sub Inspectors, Assistant Sub Inspectors, Head Constables and Constables) have attended this programme. Ms. Deeplika, Project Manager, Mohan Foundation explained as to which organs can be donated by a diseased person and living person. She also explained the concept of Brain Death and its clinical evaluation. The objective of this programme was to create awareness among the police personnel regarding donation of organs and to discuss the important role of police in this regard to save a life and also in creating Green Corridors while transporting the human organs. Chandigarh 27th September:- Dr. Ambedkar Institute of Hotel Management, Catering and Technology, Sector-42D, a premier institute providing hospitality education, an autonomous body under Ministry of Tourism, Government of India, celebrated "World Tourism Day" with zeal and fervor. Keeping in mind the great old saying " Athithi Devo Bhavah" which literary means the "Guest is God" ,the students of the institute visited the Chandigarh Railway station , Chandigarh airport to overwhelm the passengers by giving them a rose bud and wishing them "Happy tourism Day" with a wide smile. Around 100 students of the Institute also displayed a great passion for tourism while participating in "Run for Tourism" at Sukhna Lake organized by Chandigarh Administration. One of the Judges at the event said that the participants have truly captured the essence of nature with their photography and their floral incarnations. Our beautiful city of Chandigarh has been done justice in the posters by the students. This was followed by a cake demonstration by Chef Sucharu Sharma, faculty of the institute which was open to general public. Mrs. Bharti Tyagi, the principal of the Institute commended the students for their creativity and said that tourism offers a wonderful connecting thread between visitor and host community. Such contact between people of different backgrounds is a very foundation for tolerance. In the world struggling for peaceful coexistence, tourism builds bridges and contributes to peace. It makes me contented to see the competitive spirit among participants and I hope to organize many such events for the future. The day concluded with the award ceremony for acknowledging the efforts of the winners. Chandigarh 27th September:- A tasteful Lifestyle & Fashion Exhibition -The Wardrobe Story(TWS) , Fall-Winter Edition, which is being put together by an energetic & dynamic duo - Anshika Gulati, Founder, TWS and Ms. Amitoj Sandhu , Founder of Fashion Boulevard is all set to take place from 30th September- October 1 at The Lalit in IT Park from 11 am till 8 pm. The organising duo held a press meets to share details about the upcoming Exhibition at The Lalit which is partnering in the event. Participating fashion designers & labels like Ritu Kumar, which was represented by Bhupinder Kala & Babli Bedi, who is a promising & budding Fashion Designer, also interacted with the media. Mrs India 2017(1st Runner Up) Cheena Arora wore a designer dress from the stable of Ritu Kumar, while models showcased designer wear of Babli Bedi too. Imit Arora, GM, The Lalit also participated in the press meet. Anshika Gulati, Founder, the Wardrobe Story & Curator of TWS shared that the idea behind the show, TWS will be a rendezvous for a list, promising designers and buyers. It will be a platform designed with a strong notion of bringing budding designers to limelight and providing them with inspiration and experience of a few A - list designers under one roof. There are 50+ designers who are participating, to name a few Guneeta Ghai, Talash by Indra, Shilpi Gohri, Shilpa Goyal, Preeti Sidhu, Mithi Brar, Sanam Tamana, Neet, Ritu Kumar , Savita Gupta jewellery designer, Vintage Touch footwears, Roxso, Jugni by Jyotika, Dressing Loft by Isha, The peach Pit and many more. As Karwachauth, Diwali & the Wedding season are approaching; TWS intends to bring a never seen festive collection of Neo designers as well as established players. So whether you are a Fashionista or Bride to be, you will relish the shopping experience at the Exhibition. Amitoj Sandhu, Founder, Fashion Boulevard said that the market is flooded with lots of new talent and now it's time that we offer something new to fashion enthusiasts. Our designer list is quite fresh as we have brought young talent who has not exhibited at big platforms. We aim to give them exposure & buyers an opportunity to look out for something new, quirky & full of creativity. Off course we will have few A list designers too who will be there as idols for the nouveaus. Babli Bedi, a promising -upcoming fashion designer, said that she is looking forward to exhibit her collection at TWS. She is sure to get a lot of response from the fashion conscious market of tricity & will get to learn more about designing styles used by established labels. It was informed that during the Exhibition there will be live band performances with food and drinks. A special kids area where children can spend time & enjoy, while their mothers can shop at ease without worrying about their kids. It is noteworthy that Anshika Gulati is an established Makeup Artist and fashion consultant & she works for top models, brides to be, expectant mothers and even post partum depressed females. As far as Amitoj Sandhu is concerned she has been organizing weddings and events for last eight years. She has an impeccable taste when it comes to matters of fashion and event planning. TWS will have something for everyone. From designer wear to everyday wear, from crepes to cottons, from wedding wear to kids wear and home decor . So mark your diary for an enriching shopping experience this weekend at The Wardrobe Story, which will be on at The Lalit, IT Park from Sep 30-Oct 1.